With a Boxer in your family, you'll always have an eager companion for walks, runs, and romps in the yard. The Boxer is a strong, highly energetic dog with a short muzzle, the lean, muscular build of an athlete, and a distinctive underbite. Though they can look worried with their downturned mouths and wrinkled foreheads, they are actually a playful, spirited, and inquisitive breed. Their curious natures are underscored by their big, brown, attentive eyes. Boxers are also known as German Boxers and Deutscher Boxer. Boxer mixes are among the most common mixed breeds found in shelters and rescues. Boxer mixes can share traits with any number of other breeds, but will likely resemble Boxers in some physical characteristics and personality traits. Because many shelters do not have genetic evidence of a dog's background, breed heritage often cannot be stated with certainty. While most shelters and rescues cannot determine a dog's exact breed, some facilities may utilize DNA tests to determine the genetics of a mixed breed dog, and AKC registered Boxers may be surrendered to a shelter. Even with proof that a dog's heritage includes Boxers—and though the dog may show the physical characteristics of the breed—the individual dogs' personality traits may differ from the breed standard. Common Boxer mixes include Labrador, Boston Terrier, Rottweiler, German Shepherd, Golden Retriever, Bulldog, and American Staffordshire Terrier, often called the Pit Bull. While a Boxer mix may appear to have Boxer characteristics, shelters may categorize the dog first by the less common breed if it exhibits obvious physical characteristics or personality traits of that breed. Coat - The Boxer's coat is short and smooth with a sheen. The coat colors are fawn and brindle, with fawn ranging from light tan to deep mahogany, and the brindle stripes varying from sparse to abundant. The Boxer can have a black mask on its face and spare white markings, especially on the face and front of the body. 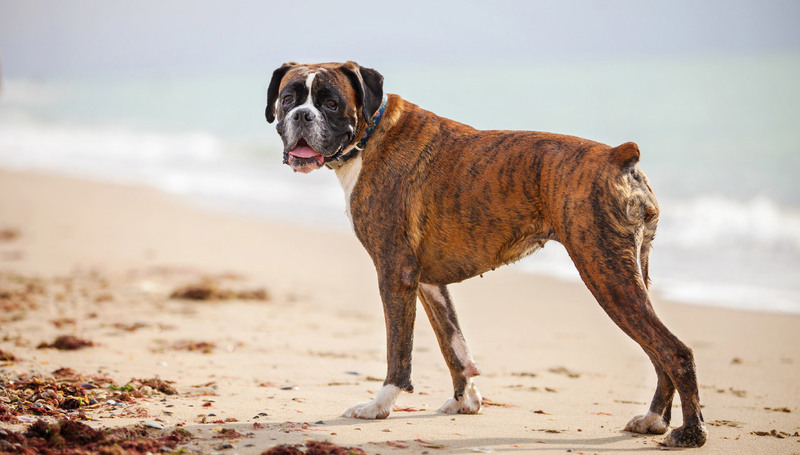 Boxers have a medium, square build with strong muscles clear under their short, smooth coats. They carry their heads proudly, showing off their distinguished, chiseled head with the distinctive underbite, short muzzle, and jowls. Their foreheads ideally have slight wrinkling, and they have an intelligent and alert expression in their dark brown eyes. Boxers move with energy, agility, and a touch of elegance. Boxers have a shared ancestry with the English Bulldog, with both breeds descended from the extinct Bullenbeiser, or 'bull biter' breeds of central Europe. These breeds had powerful jaws and underbites that enabled them to hang onto large game, such as deer and wild boar, until the hunter arrived. Boxers evolved in Germany when Bullenbeisers were mixed with mastiff-type dogs, bulldogs, and terriers. Early Boxers were used to manage cattle in slaughter yards, but would go on to be trained as exceptional police, military, and guide dogs. Boxers are intelligent, energetic, and loyal. They are amiable and attentive with family members, though they can be reserved with strangers. Boxers are high-spirited companions requiring consistent training and plenty of exercise to keep their rambunctious tendencies in check. Are Boxers Good with Kids? Yes. Boxers are gentle and fun-loving with kids, though their energy must be managed or they can become overly boisterous. They love plenty of affection and attention from children, as well as adults. Are Boxers Good with Other Pets? Boxers can be friendly with pets they live with, but can be aggressive with unfamiliar dogs. Boxers should be socialized from an early age to be gentle with other dogs and pets. Boxers are very protective if they perceive a threat to their family. Are Boxers Good Guard Dogs? Yes. Highly attentive, intelligent, and alert, Boxers make good guard dogs. Often, they will bark to alert you when people approach your home. Boxers have very high energy levels. They require long walks and playtime throughout the day to keep them healthy and prevent the development of destructive habits due to boredom and excess energy. Acepromazine — a common canine sedative — can cause dangerous heart arrhythmias in Boxers. Independent-minded, they require consistent training to respect the rules. They require abundant mental stimulation and physical activity to prevent boredom. They love to jump and leap, and should be trained young not to jump on people. Indoor In between excursions outside, Boxers belong indoors with their owners where they enjoy time playing and snuggling with their beloved families. In cold weather, they'll need the extra protection of a dog coat to supplement their short coats. Outdoor Boxers will spend ages outside playing as long as they have a family member or two playing with them. They love taking long walks to explore, and playing in the yard or at the dog park with four-legged friends. Exercise Boxers require several long walks a day—an hour-long walk wouldn't tire them out. Beyond walks, Boxers benefit from running and games of fetch. Endurance Boxers have stamina to spare and will keep up with you for long walks and play sessions. Running Miles: Boxers can run several miles each day, as long as the runs are broken up. Because they can have joint problems, it's best they don't run for long stretches on hard surfaces. Hiking Miles: A healthy Boxer can hike for up to three miles. Food The healthy weight of a Boxer can vary significantly, so they may require anywhere from 1 ½ to 6 cups of quality dry dog food per day. Watch your Boxer for signs of weight gain. Alone Time Boxers always prefer company, but they have the temperament to spend several hours alone. Beyond a few hours, they will need a long walk for exercise. The short, smooth coat of the Boxer is easy to care for. A few brushes per week will keep his coat shiny and healthy, and help minimize stray dog hairs throughout your home. Your Boxer needs only the occasional bath, though you can bathe him with a gentle shampoo as often as once a week if he gets messy during walks. Gently clean his ears when they need it and trim his every few weeks. Boxers train well, with their exceptional intelligence and endless curiosity. They get bored from repetition, however, so it is preferable to train them thoroughly and consistently when they are young. With their athleticism and smarts, boxers are great candidates for agility training. Advanced training is also a great way to keep this breed busy and mentally challenged. Loyal, smart, and alert, Boxers make excellent hunting dogs. No. Boxers shed and, as a result, release pet dander in your home. Dander is the cause of most pet-related allergies. Yes. Because they have shortened noses, Boxers are a brachycephalic breed. However, the condition is milder than in breeds with flatter muzzles, such as English Bulldogs and Pugs. Boxers are more tolerant of exercise and heat than other brachycephalic breeds. Boxers are not natural-born swimmers. They can learn to swim, but may require a dog swim vest. They definitely need close supervision in or near water.